These days, the financial industry’s locus of power can’t be found in London. It’s not in New York City. Frankfurt? Tokyo? Davos, Switzerland? Nope, nope, and nope. The real decisions that impact the capital markets are being made in Washington. And they’re sometimes being made by politicians who don’t really have a clue about how the industry works, or what unintended consequences their actions may have. If that doesn’t scare you, I don’t know what will. Look no further than last week’s market carnage for proof of who’s in charge. The market was continuing on its merry way — until Washington lobbed several curve balls at Wall Street. The reaction was swift and severe: The overall market suffered its biggest hit in months, with financial stocks getting hammered particularly hard. Moreover, the “VIX” index of volatility surged 55 percent in a span of three days. We haven’t seen a move that large, that quickly since 2007. It’s clear to me that the political tides are shifting for the financial industry — and not in a good way. This could have widespread implications for the markets I follow most closely, so I want to expand on some key points. Bankers No Longer Free to Run Wild? 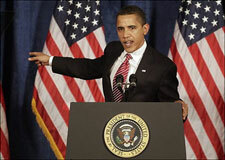 President Obama shocked the markets last week with a new plan designed to rein in the nation’s banks. It would specifically bar banks from holding or investing in private equity and hedge funds that aren’t related to customers they’re serving. Banks also would have to shed so-called “proprietary trading” units that use their own capital to place bets on the market. Combined, these moves could impact companies like JPMorgan. It runs a OneEquity Partners PE unit that makes $8 billion in investments. It could also hammer prop trading houses like Goldman Sachs and Morgan Stanley, which generate billions of dollars in revenue from such activities. President Obama has shocked the markets with a plan to rein in the nation’s banks. In the bigger picture, as Martin noted earlier, this signals that the “Bailout Brigade” of Treasury Secretary Tim Geithner and Fed Chairman Ben Bernanke may be losing influence. The outrageous behavior of Wall Street firms and the banking industry — and Washington’s coddling of them — have finally pushed average Americans over the edge. Result: The policymakers in Washington are finally being forced to listen to the masses — and the bankers and their lobbyists are running scared. So are bank investors, who have grown accustomed to a steady diet of D.C. handouts. 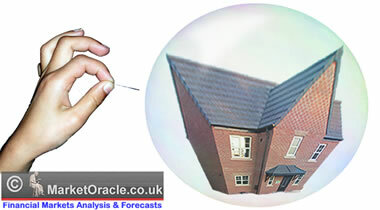 Change is also afoot in the housing and mortgage arenas. The Federal Housing Administration, or FHA, has been making overly lax loans for several quarters now — even as house prices fall and defaults rise. Its credit reserves are running at the lowest level in modern history, raising the risk of yet another massive bailout. But in an about-face from the recent trend toward blindly marching off a cliff, this federally-backed mortgage lender is tightening the screws. It plans to soon implement higher down payment requirements for borrowers with lousy credit. It’s also jacking up the upfront premium borrowers have to pay into the program from 1.75 percent to 2.25 percent of the loan balance. Those premiums fund insurance that protects lenders for losses on FHA loans. Finally, FHA will ask Congress for authority to raise the monthly premiums that borrowers have to shell out along with their regular payments. A few years ago, when the FHA program was a seldom-used option for mortgage borrowers, something like this would hardly matter. But FHA now guarantees roughly 3-in-10 of all mortgages being made. So its move could be significant. At the same time, the administration isn’t entirely cutting off the housing and mortgage industries — or borrowers, for that matter. Reports are now circulating that the Obama team will soon revamp either its $300 billion Hope for Homeowners (H4H) program or the larger Home Affordable Modification Program (HAMP). We may even see changes in both. These programs are designed to reduce foreclosures through the use of loan modifications, or “mods.” But they’ve failed to significantly — and permanently — stem the flood of home repossessions because they don’t aggressively attack the “negative equity” problem. Efforts are underway to reduce foreclosures through the use of loan modifications. What do I mean? These days, borrowers who go to their lenders or the government for help typically get their interest rates cut, their loan terms extended, and/or their monthly payments lowered. But their lenders don’t cut the amount of principal they owe. That leaves borrowers owing, say, $450,000 on a house that was once worth $500,000 but now is worth just $300,000. The question isn’t “Why WOULD you just mail the keys back to your lender?” in that situation. It’s “Why WOULDN’T you?” Even if home prices immediately turn around and start rising at their historical rate of a few percentage points a year, it would take ages for you to build positive equity again. “Higher loan-to-value ratio mortgages have ALWAYS had higher default rates than lower LTV ones. Why? When borrowers have none of their money at risk — skin in the game, if you will — they have no vested interest in sticking with the property. They’re giving up nothing by walking away. Because neither H4H nor HAMP has lived up to expectations, the political pressure on the administration is reaching a tipping point. And if the administration responds by fixing that crucial “principal reduction” flaw, it would be a big deal. It would be a significant step toward lowering the foreclosure rate and helping out the housing market. So what does this all mean for you, especially if you’re investing in financial stocks or bonds and related industries? You simply can’t be as bullish on them as you were when Washington was their best friend. Policy is no longer being written by a bunch of bank lobbyists, then rubberstamped by the Wall Street cronies in Congress and on the Obama administration’s financial team. That’s good news for the long-term health of the country … but a potential chink in the armor for the markets, especially financial stocks. At the same time, the nasty knee-jerk market reaction last week could scare policymakers right back into bailout mode. If stocks roll over … if home sales continue to slow (as opposed to just suffer a post-tax-cut hangover for a month or two) … and if mortgage credit tightens anew, the Bailout Brigade might be rolled right back out again. What is certain is that volatility and confusion levels among investors will rise. So while it’s not exactly time to go all-in short here, or dump all your “longs,” it IS time to pare back your exposure, take some gains off the table, and let positions that get stopped out stay that way. Then we’ll see how this all shakes out.